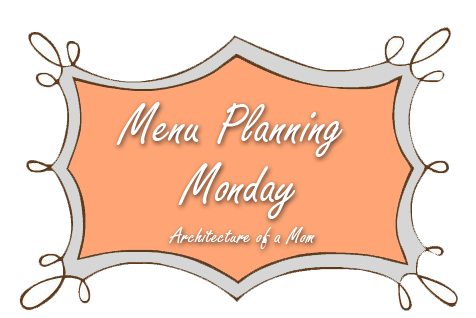 Welcome to a Menu Plan--Stay-cation style! My in-laws are on their way to our house for the week as I write this post. They live in Mississippi, so we don't see them often so everyone is super excited to see them. We may take a day trip or two, but at this point, we're going to be around the house quite a bit, I think! However, there is one major thing planned for the week. My husband and I will be celebrating our 8th wedding anniversary by staying at a in-town hotel. This is the first time that I have ever spent the night away from my kids that hasn't involved a hospital stay (like when I had the twins and my oldest stayed with my parents). We are going to eat at a nice restaurant and go see a movie. I have to say that I am excited at the prospect of eating a meal out where I don't have to say things like, "You have to eat your vegetables if you want dessert," or "Please don't put your food in your hair." It's the simple things, I'm telling you. If you have kids, you understand. If you don't have kids, just trust me! Anyway, we are also expecting our produce basket tomorrow, and I am actually going to go pick it up since I'm not working. We're getting an extra fruit basket since we have guests and we're all home from school and work. I'm looking forward to some yummy stuff! I have a feeling I'm going to have a lot of BLTs at lunch since in addition to the produce baskets we have tomatoes coming in from the garden. Anyway, here's the plan. I'm expecting it to change some, since we have the flexibility of being around, and we just might go out to eat, but here's to having meals in the works just in case! Sunday: Leftovers or going out to eat!